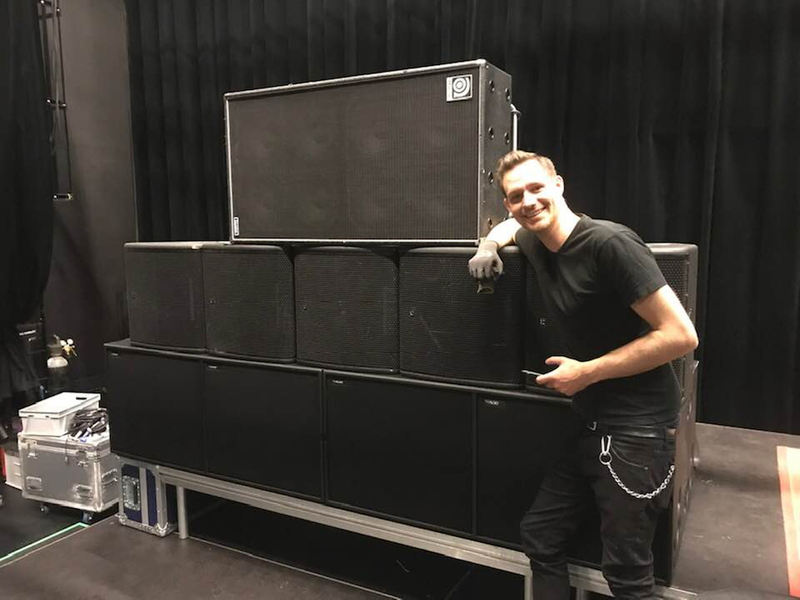 These are just the bass speakers. 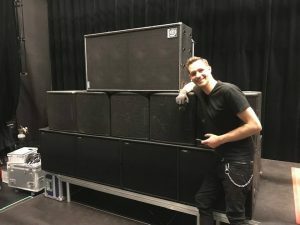 The stats on these subwoofers before being set up at Kulturhuset: Four 21-inch, five 15-inch and eight ten-inch. Photo by Kyrre S. Fledsberg. “To hear the best band in the word and drink some f***ing beer,” he said when asked about his motivation. Some passionate participants aren’t devotees, or even all that familiar with Manowar’s music – they’re just here for an experience stretching well beyond the stage. 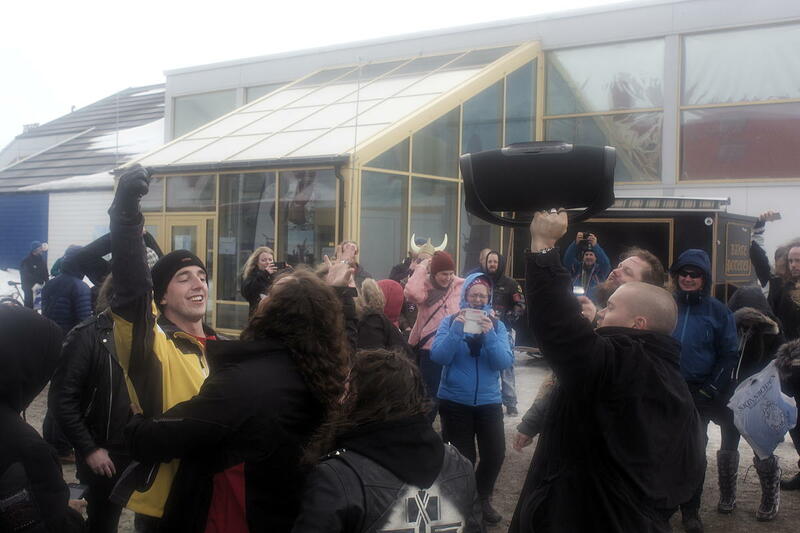 “When I heard Manowar was playing here I knew I had to come here and document it,” said Hedda Bremseth, a filmmaker from Trondheim who was holding a bullhorn as she prepared to lead a pre-concert parade she organized Monday afternoon in the center of Longyearbyen attended by several dozen people wearing Viking helmets and singing along to boomboxes. The celebrations are expected to be prolific and loud, in the spirit of the band itself. “You’ll probably be able to hear them at Coal Miners Cabin,” said a taxi driver watching the parade gather, referring to a guest lodge three kilometers from the concert site. Manowar is an American heavy metal band from Auburn, New York. Formed in 1980, the group is known for lyrics based on fantasy (particularly sword and sorcery) and mythology (particularly Norse mythology and Greco-Roman mythology). The band is also known for a loud and bombastic sound. In an interview for MTV in February 2007, bassist Joey DeMaio lamented that “these days, there’s a real lack of big, epic metal that is drenched with crushing guitars and choirs and orchestras… so it’s nice to be one of the few bands that’s actually doing that”. In 1984 the band was included in the Guinness Book of World Records for delivering the loudest performance, a record which they have since broken on two occasions. They also hold the world record for the longest heavy metal concert after playing for five hours and 1 minute in Bulgaria (at Kavarna Rock Fest) in 2008. They also have been known for their slogan “Death to false metal”. Although the band has never been a mainstream commercial success in the United States, they maintain a strong cult following. Dedicated fans are known and referred to by the band as “Metal Warriors”, “Manowarriors”, “Immortals” or “Brothers of Metal”..